he Mavic 2 is the most advanced DJI camera drone ever built, designed for professionals, aerial photographers and content creators. Incorporating the iconic folding design of the world’s most popular Mavic Pro, the Mavic 2 is a powerful platform with new gimbal-stabilised cameras and advanced intelligent features like Hyperlapse and ActiveTrack for easier and more dynamic storytelling. 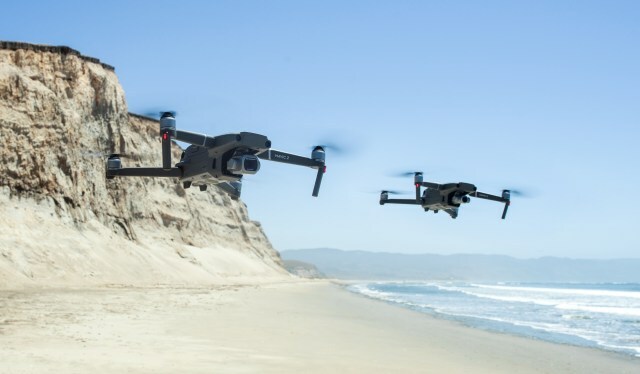 With an impressive flight time of up to 31 minutes and a more stable video transmission system, Mavic 2 delivers the optimal flight experience for capturing epic shots. An improved Advanced Pilot Assistance System (APAS) allows the aircraft to analyse its surrounding environment and automatically fly around obstacles without stopping. In addition, the Mavic 2 has a Bottom Auxiliary Light that turns on automatically to ensure safe and precise landings in low-light situations. The retail price of a Mavic 2 Pro, including the drone, battery, remote controller, charger, and four pairs of propellers, is €1,449 (£1,299). The retail price of a Mavic 2 Zoom, including the drone, battery, charger, remote controller and four pairs of propellers, is €1,249 (£1,099). A Fly More Kit, including two additional batteries, a multi-battery charging hub, a car charger, a battery to power bank adapter, two pairs of propellers and a carrying bag, retails at €319 (£279). A gimbal replacement service exclusively for Mavic 2, will be available soon.